The Garbage Pail Kids may have started as cards, but it quickly became a multimedia property. 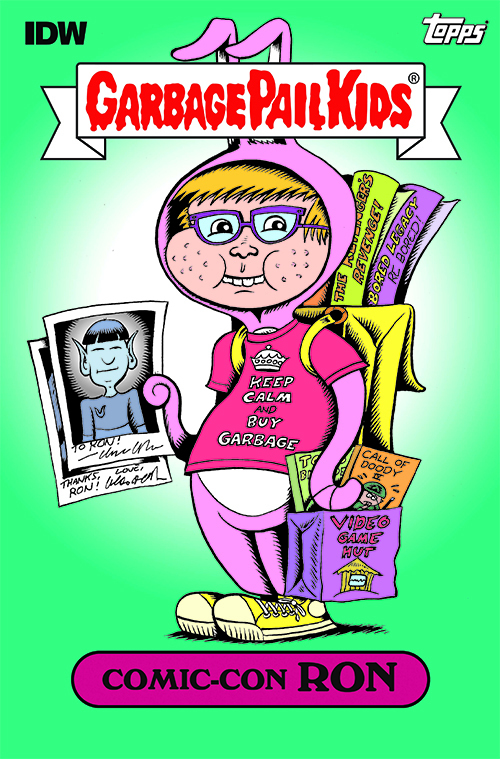 While the movie and cartoon were quickly cast away and largely forgotten, GPK's have continued to march on. With a 30th anniversary on the horizon, a new direction is coming in the form of a Garbage Pail Kids comic book from IDW Publishing. "As a child of the '80s, I was at ground zero for the Garbage Pail Kids phenomenon," said series editor Denton J. Tipton via press release. "The profoundly irreverent stickers spoke directly to the rascal inside each and every one of my classmates, and helped us drive our teachers to the brink of insanity. I couldn’t be more happy to be working with some of the giants of alternative comics to push the buttons of an entirely new generation of educators, many of which likely remember when the poo-covered sneaker was on the other foot." Set to debut in 2015, the title will be formatted as more of an anthology. Stories will connect, but only loosely. Creators will be a mix of current Garbage Pail Kids artists as well as others within the industry. With the announcement being made at San Diego Comic-Con, Hate's Peter Bagge debuted a new character, Comic-Con Ron. Bagge will be involved in the new Garbage Pail Kids comic. This isn't the first time Topps and IDW have partnered. IDW has published a handful of stories based on Mars Attacks. Garbage Pail Kids ANS2 sealed bonus card box all new series 2 B1 rare box mint.